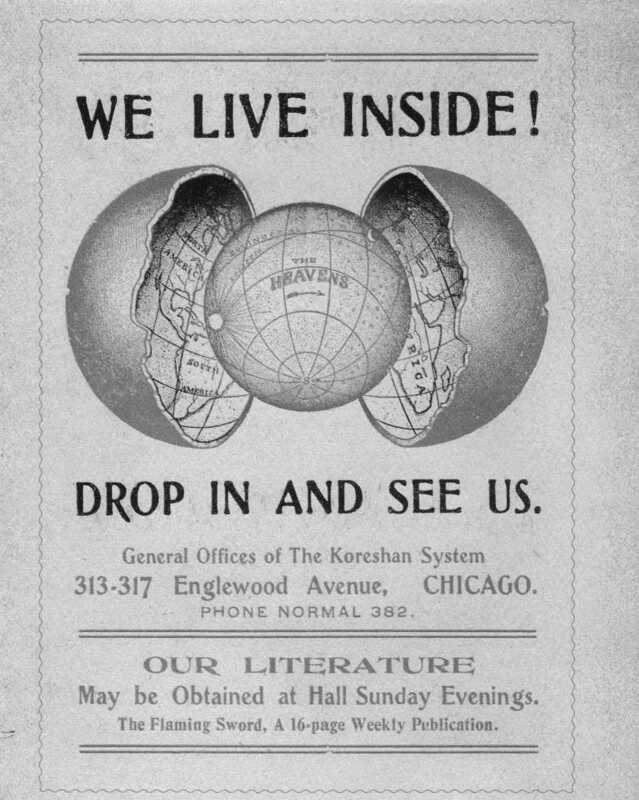 A handbill with a diagram of the Koreshan Hollow Earth. Florida is huge, not huge in the way of Texas or Alaska or California, where everyone seems to know and acknowledge the hugeness, but huge in the way that I’ll have friends from Mundania (Piers Anthony’s name for all of those non-magical, non-Florida places) visit Miami and expect me to drive down from Tampa to meet them for lunch. Complicating things is the fact that most of the population lives on the coasts, and much of the the center of the state is a muddle of wilderness, farms, swamps, and phosphate mines, and even in such a crowded place, there are some solid swaths of just NOTHING. Roughly between the Civil War and The Great Depression, the idea of Florida as a ’Blank Slate,’ a place to start over, or a place to remake in your own image, took hold. This idea is still out there, to an extent, but not to the degree that it was in those Land Boom years. Perhaps the strangest feature of this time is the proliferation of settlements founded by Utopian societies. Founded on religious or social ideologies, these settlements typically popped up, lived brief lives, and then either disappeared or were eventually absorbed by the mainstream society they were trying to escape. And some of them (most notably the Spiritualist camp at Cassadaga), are still there. I'll start with Ybor City (about 5 minutes from where I live in Seminole Heights): Though Ybor is mainly known as a party spot or as Tampa’s historic immigrant district, its founding as a company Town for Don Vincente Ybor’s cigar factory reveals its Utopian roots. Ybor’s ideology is hard to read, but he wrote and spoke about wanting to establish Ybor City as a kind of worker’s paradise after labor conflicts shuttered the cigar industry of Key West. Ybor established a factory where workers made solidly middle-class wages, where elections were held for foreman positions, and where workers could take a hot shower after their shift (seen as a ridiculous extravagance in the 1880’s). He also built housing blocks with communal gardens and helped establish mutual aid societies that provided benefits like healthcare and retirement pensions. Ybor’s experiment was relatively successful, however, when his factory was sold to the Havana-America corporation after his death, things changed, leading to a long era of strikes and lock-outs. Trying to find the history under the surface in Ybor can be fascinating and frustrating. Unfortunately, the original Don Vincente Ybor factory is occupied by a large Scientology Center. You can still take a tour, and it’s still interesting, but they’ll try to talk you into a stress test while you do it. A couple of hours south is Estero, and the site of the Koreshan Unity. Much of the time, when I mention the Koreshans, someone asks “Like in Waco?” No, not like in Waco, the two groups have nothing to do with each other. 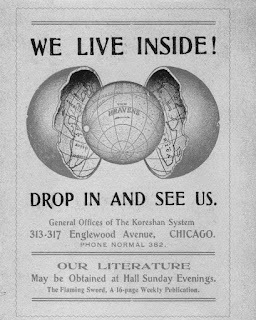 The Koreshans were a religious group established in the late 19th-Century by a man named Cyrus Teed, who took to calling himself Koresh. Their beliefs were sort of a mash-up of Christianity, Spiritualism, Pseudoscience, and Astrology. They’re best known for their commitment to the idea that the earth is hollow, that we’re actually walking around on its concave insides, and the whole rest of the universe is contained within it. In 1895, Koresh (Teed) took his followers to a piece of land near the Estero River to establish his vision of ‘New Jerusalem,’ a massive city that would stretch from the Everglades to the Gulf and that would be home to ten-million devoted Koreshans. The settlement, of course, never grew to that size (the Koreshan preference for celibacy probably didn’t help), and they declined quickly after Teed’s death in 1908. Their settlement is now a state park, and a particularly beautiful one. You can tour the remaining buildings like the Art Hall where they staged elaborate musical and theater productions, and the Planetary Court, where the settlement’s nine ruling matriarchs lived. In 1905, Jo Sakai bought a piece of land in what is now Boca Raton, in Palm Beach County. He recruited people from his hometown of Miyazu, Japan to grow pineapples, and the group established what became Yamato Colony, a traditional-style Japanese farming community in South Florida. Yamato was short-lived, as competition from Caribbean fruit, and the land boom of the 10’s and 20’s caused many of the farmers to sell their land and return to Japan. Still, several of the Farmers of Yamato Colony remained until the U.S. entered World War II. Florida’s Japanese-Americans were not put in internment camps like they were in the West, but they were subject to close surveillance, travel restrictions, and seizure of property. The last Farmers of Yamato Colony had their land confiscated by the U.S. Government in May of 1942 to create an Army Air Corps training center (now the Boca Raton Airport, and part of Florida Atlantic University). The farmers of Yamato, however, were paid for their land, and a few of them even bought new farms after the war was over: one of them was George Morikami, who started a new farm in nearby Del Ray Beach. His farm is now a park, and the site of the Morikami Museum and Japanese cultural center, the only things that remain of Florida’s Yamato Colony. The Spiritualist settlement of Cassadaga is one of the best-known, and most successful, examples of the Florida Utopian Phenomenon. It’s well known as the ‘Psychic Capital of the World,’ but there’s more to the place than just palmists and card readers (though that can be a good time too). Cassadaga was founded at the height of the American craze for communicating with the dead. George Colby was a medium who traveled the country allegedly helping people contact their dead loved ones. Colby would throw himself into a trance and contact various spirits to gain insights into both this world and the next. During a séance in Iowa, One of Colby’s guides, who he described as a Native-American named Seneca, instructed Colby to travel to Florida, to a specific place near a spring where the water could enhance psychic powers. Colby found the place Seneca had shown him and founded the Spiritualist Camp of Cassadaga. Today Cassadaga is part tourist trap and part authentic oddity. It’s also close to some amazing natural beauty (like Blue Spring and Hontoon Island), and in the town itself you’ll find every stripe of psychic and mystic you could ask for. The Cassadaga Hotel, built in the 1920’s, on the site of an alleged spiritual vortex, has a dedicated séance room, and enough ghost stories to keep you awake all night. The local cemetery is home to the notorious Devil’s Chair, where (as the legend goes) you can sit to wait your turn for an audience with Satan himself. These are only a few of the attempted utopias that dot the map of Florida, and while so many of them are artifacts of the past, it seems that the perception of this peninsula as a place where someone can remake the world in their own image is a persistent phenomenon. In more recent times we’ve seen idealistic attempts like The Nautilus Foundation and The Venus Project appear, bloom for a while, then decay (future article!). We’ve also seen the rise of Scientology’s massive compound in Clearwater, and of Disney’s corporate micro-state (technically called the Reedy Creek Improvement District), both of which both seem to be expressions of beliefs held by singular humans (Walt, and L. Ron, respectively). Well done, really enjoyed reading about the state through your eyes. If you like what I'm doing here, help me keep doing it, you can support Florida Is A Verb by sending me a little cash. Streetcar Apocrypha: Tampa once had one of the nation’s best transit systems. What happened? Check us out on Instagram for more desinations, food, birds, and other stuff. Get Florida Is A Verb in your e-mail inbox. 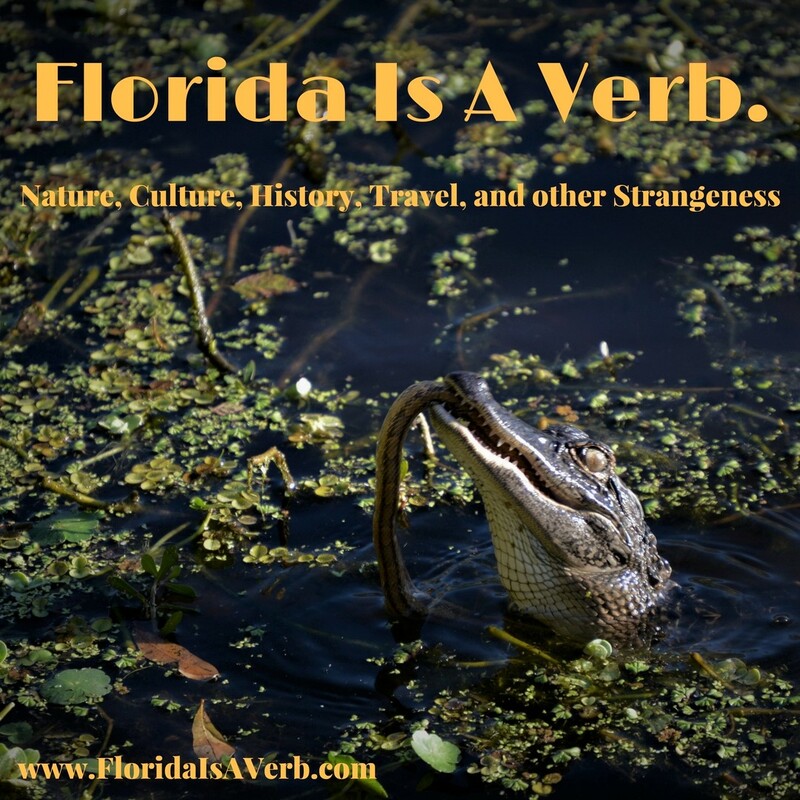 I'm always looking for new ideas, guest articles, odd photos and other florida-ness- if you have anything like that you want to share, you can send me a message at Editor@FloridaIsAVerb.com.